The ForkenSwift was built by combining the best parts from a 1993 Suzuki Swift (which turned out to be too rusty to use) and a 1992 Geo Metro. The cars were essentially the same. The only big difference was the Suzuki had a 4-cylinder engine where the Metro had a 3-cylinder. Why did we choose this car for the ForkenSwift? Weight: it's a major enemy of efficiency. At under 1800 lbs, these cars were among the lightest available in the North American market. A small, light car can be a poor choice for an EV conversion if there isn't enough space or payload capacity to hold the batteries (usually lead acid). But with a relatively small 48 volt pack, we knew we'd be OK. Cost: they were cheap to buy new, and they're even cheaper to buy used. This pair of cars cost $250. Availability: between GM and Suzuki, probably several hundred thousand cars built on this platform were sold from the late 80's to the late 90's. They're easy to get parts for, and used ones are still kicking around (though fewer in the rust belt). 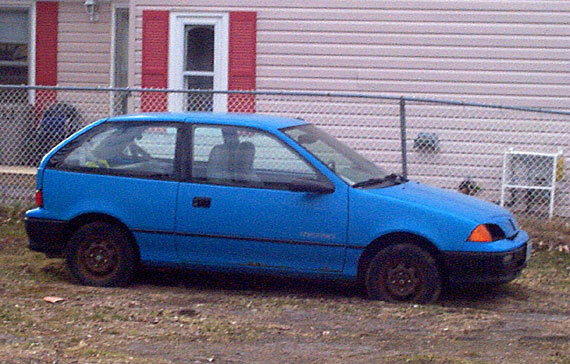 Not a day after deciding the red 1993 Sukuzi Swift was too rusty to repair, I spotted this 1992 Geo Metro in Ivan's neighbourhood, settled into ruts in someone's yard. It looked like it hadn't been driven for quite a while. I knocked on the door of the house, and the woman who answered said, "why sure it's for sale!" After jump starting it, the car ran & drove, though there was the smell of gasoline at the rear, a hole in the exhaust and something loose in the front suspension. A quick look underneath revealed the body was in much better shape than the red car, though on initial inspection it looked like there were a few rust spots in the floor that would need to be patched. A deal was done for $175. April 6, 2006: 186776 km (116057 miles) on the clock when we bought it. What does $250 worth of Suzuki clones look like?